The Eclipse Runner plugin improves the way of dealing with launch configurations in the Eclipse IDE. 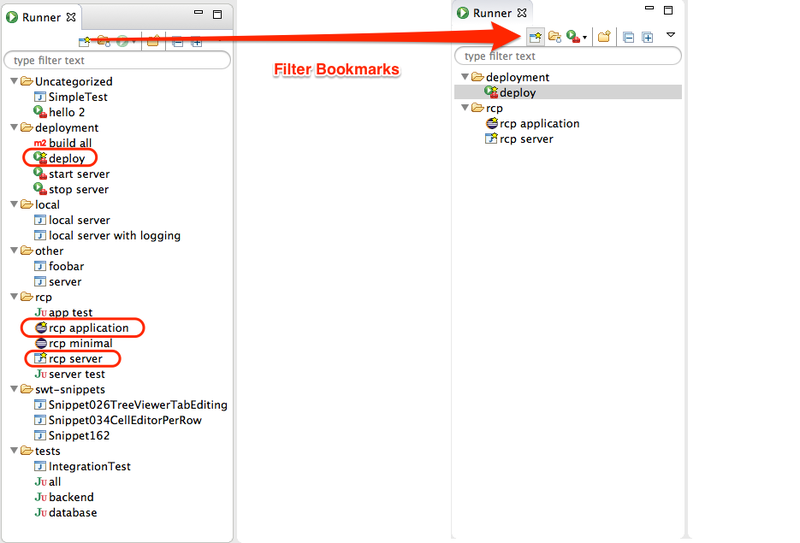 The plugin adds a new view called "Runner" to Eclipse. The view allows you to categorize and bookmark launch configurations in groups for example or to run them directly from within the view by double clicking on them. Keep your launch configurations organized. Categorize your launch configurations in custom groups. 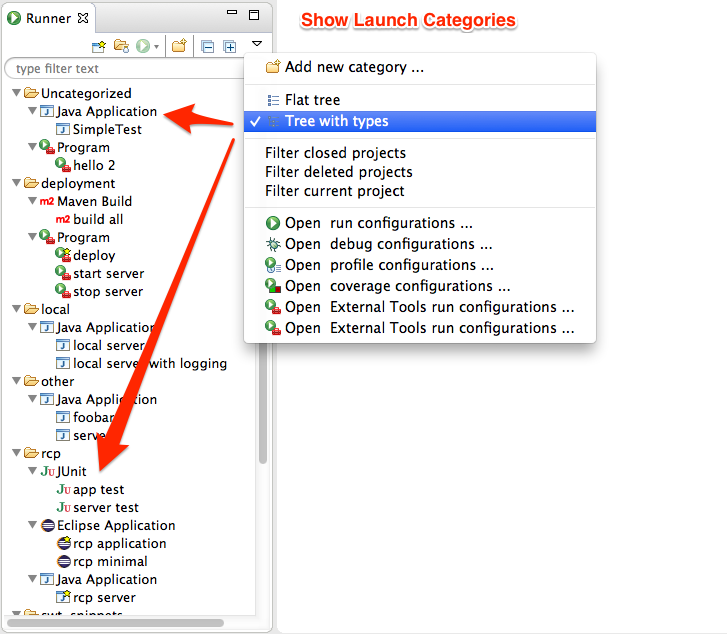 Browse your launch configurations in the separate Eclipse Runner view. 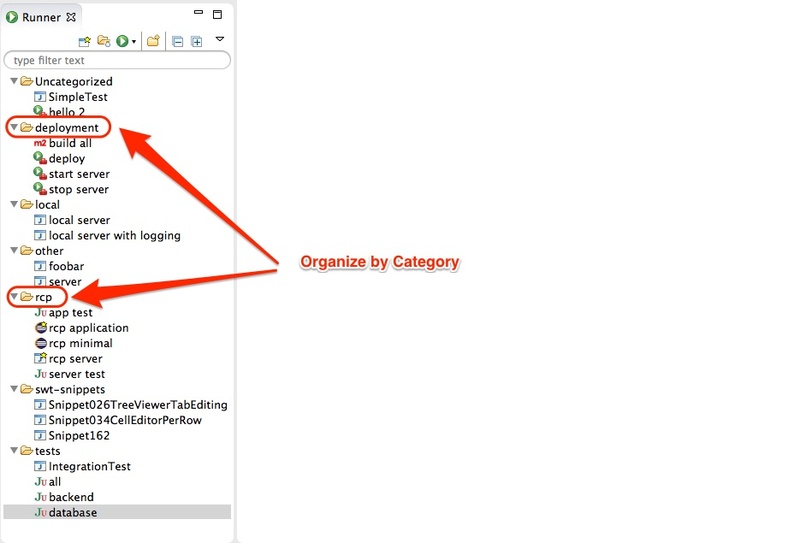 Open the associated resource behind the launch configuration in the editor (e.g. the associated Java main class). Run or debug launch configurations directly from the view by double clicking on them. Contribute patches and new features. Help is always welcome. If you notice any bugs or missing features open an issue over at GitHub. By adding the following code below to your website you will be able to add an install button for Eclipse Runner. Plans for 201812 (4.10) support? I really love your plugin! I switched to 2018-12 (4.10) but I cannot install it on this version. I see that you already support 2018-09 (4.9) and 2019-03 (4.11). Any chance for 4.10 as well? Re: Plans for 201812 (4.10) support? I have added v4.10 to the list of supported versions of this plugin. Please try again to install the plugin and let me know if it works now. I use this plugin on a daily basis. Well done, thank you! I see 2018-09 (4.9) and 2019-03 (4.11) are already supported, any plans for supporting 2018-12 (4.10) as well? I cannot install this form the marketplace in my version. Thank you for writing Eclipse Runner which I wish I had installed before today. I wonder if you might consider adding a facility to export from the launch configuration to a runnable jar file (or some other similar types of export). As the launch configurations are used to specify things like the Main class etc it would seem quite logical. Thanks a lot for your feedback! Currently there are no plans to add such a feature. The ultimate goal of the eclipserunner plugin is to enable you to quickly execute repetetive and often needed tasks. Tasks which you need very often during development. E.g. starting a specific unit test while you are browsing code in an unrelated source file. I think that the use case "exporting your program to a runnable jar file" is a task you typically execute far less often than use cases like "executing a specific unit test" or "start one of the programs which you have currently opened in your IDE". Therefore I am not going to spend my time on implementing such a feature. But, I would happily accept a pull request if you want to contribute code implementing the feature requested by you. If you want I can also help you getting started... Just let me know. The Eclipse Marketplace has been updated to contain a valid Eclipse Runner P2 update site. Installing this plugin using the Eclipse Marketplace now works again. Lukasz and I are currently working on to update the Eclipse Marketplace with a valid P2 update site. In the meantime you can use the update site from my eclipserunner repo (zaunerc/eclipserunnerplugin @ GitHub) or the update site from Michaels eclipserunner repo (scharf/eclipserunnerplugin @ GitHub). Feature-wise both repos currenlty contain the latest plugin version. Hint: To browse the contents of Michaels P2 update site you need to use a P2 repo browser (e.g. the Repository Browser Plugin from the Eclipse Oomph project). Using a HTTP browser will result in a 400: Invalid request. The icon of eclipse runner plugin does not view well with eclipse when dark theme is enabled. Please update the icon of eclipse runner plugin by having transparent borders (png). Thanks. Just a quick question - is there a way to export the settings? We have the same launch configurations over a number of laptops and it would save time if the settings are exportable. I'm not working on the plugin any more, but today o got an email from Michael who has forked the project in github and we're going to release a new version. So maybe it's a good moment for you to join the project and implement export functionality ? :-) i suppose it's not a big deal. if you're ready to hack, write me an email and i'll give you commiter rights to the plugin. Nice feature. Save a lot of time! very nice, simple and usefull tool =) if you have dozens of run targets - it's essential plugin for you. thanks a lot guys!